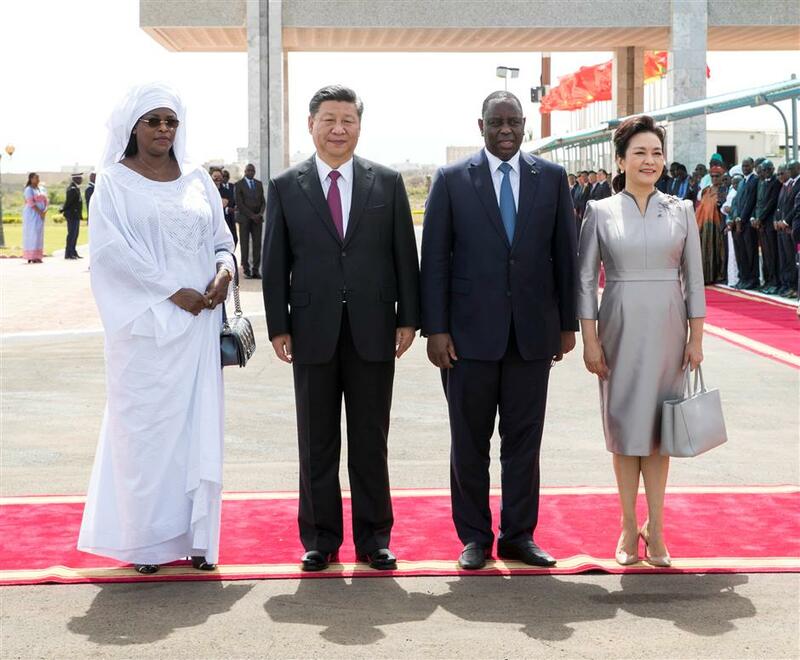 Chinese President Xi Jinping and his wife Peng Liyuan pose with Senegal President Macky Sall (second right) and his wife Marieme Faye Sall (left) at the Leopold Sedar Senghore military airport in Dakar on Saturday. Xi Jinping inked a clutch of trade accords on his first visit to Senegal. The two leaders spoke highly of the development of bilateral ties in recent years, and agreed to continue to make efforts and promote more fruitful results from cooperation in various fields. Xi arrived earlier on Saturday for the first state visit to Senegal by a Chinese head of state in nine years. He will travel to Rwanda next, followed by South Africa for a BRICs summit of developing nations on Wednesday. In Dakar, the Chinese president recalled the joint decision to forge a comprehensive strategic partnership between China and Senegal. Xi said that thanks to joint efforts from both sides, China-Senegal relations have entered a fast track with growing political mutual trust and concrete economic and trade cooperation. Noting that the two countries should strengthen the alignment of development strategies and policy communication, Xi welcomed Senegal as the first West African country to sign a Belt and Road cooperation document with China. “We hope to take this opportunity to comprehensively upgrade China-Senegal cooperation,” he said. China supports Senegal in playing a greater role in global and regional affairs, and is willing to strengthen communication and coordination with Senegal in major international and regional issues such as peace and security in Africa, the United Nations and climate change, so as to protect the common interests of Africa and developing countries, the Chinese president said. Noting that he attaches great importance to China-Africa ties, Xi said he feels strongly about the long-term friendship between China and Africa, and their common future in sharing weal and woe. China will continue to uphold its African policy and concept of sincerity, concrete results, affinity and good faith, uphold justice and pursue shared interests, promote the construction of a closer China-Africa community with a shared future, so as to realize win-win cooperation and common development, Xi said. For his part, Sall thanked President Xi for visiting Senegal in his first overseas trip since being re-elected as Chinese president, saying that it is Senegalese people’s honor. Hailing that China made significant contributions to humanity’s progress in history, Sall said today’s China is playing an even more important role in international affairs. Senegal, Sall said, admires China’s development achievements, appreciates China’s precious support for Senegalese economic and social development and its implementation of revitalization plan. Senegal firmly adheres to the one-China policy, is committed to deepening the strategic ties with China, is ready to enhance cooperation in areas such as infrastructure, water conservation, industrialization, agricultural product processing, tourism, culture and sports, said Sall. After their talks, Xi received Senegal’s top medal of honor from Sall.